I know the KOTOR characters, but that was about it... Actually I was kinda digging the Rahk Ghoul's because it was giving me hope of more obscure characters from KOTOR, not just important ones. HK-47 was the highlight of the list to me... And he's the pack-in pieces. Go figure. From about 7th grade, until about a year ago - I must have read 50 Star Wars novels full of characters I'd be interested in buying figures of. But all Hasbro seems to want to make is comic book and video game figures. I think it is because it is easier to make a figure from the comics or the video games. Both comics and games are a visual media type, so there is actually one set look for the characters. Whereas for a character from the novels we all may have a different mental picture of each particular character. Settling on a final figure design that will please as many people as possible would be very difficult. I am actually pretty excited for this wave, mostly because I dont know any of these characters so that way i can just pass on them completly and the money that wouldve gone into it will probably go into the MF. I think some characters are going to get made from media that didn't really have art to it... Keyan Farlander's getting a figure, and granted he's from a game, but he's never pictured. The only thing he ever got a picture from was an essential guide I think, and that was for his time in the NJO series of novels... His game character is unidentifiable and never pictured. I think we'll see more characters from novels if they get some kind of graphic representation then... Kind of like the Zahn Trilogy figures we get through their comic adaptation. That works for me. ...Kind of like the Zahn Trilogy figures we get through their comic adaptation. That works for me. Man, we need some Noghri! to me this wave looks like a partnership between Dark Horse and Hasbro to help the martket become familar with Current Comic books that new fans can jump into now and open new sales. 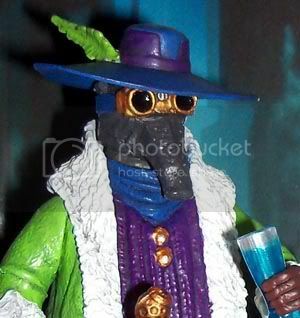 I deffenetly see Hasbro going back and mining older comics, video games and novels for more figs, But the more reference pictures there are available for a character the better chance we will be seeing it in plastic. I would have rather they focused on KOTOR characters from the games like Bastilla Shan, Ordo, Sion. I am stoked about HK-47, at least one made it. Most of the characters are flatliners. It is a great way to get Krayt and a Jedi Cade in the line. I just feel they are giving Legacy a little too much love for being around for such a short time. The Rebellion Luke might be cool too. Cool, I've never seen that pic before. I see the image comes from a scan of the Insider magazine. Is that the only place to locate the pic, was it used elsewhere? The use of the picture as a reference for a new figure gives credence to the idea that other such pictures including those used in the Essential Guides should be sufficient reference material to make certain novel characters into figures. Of course Hasbro could say they only used the image above because it was for a Luke figure and they wouldn't do this elsewhere, but that would be a cop out on their part I think. Since I was in the 4th grade until... well, now, I've read the entire Marvel/Dark Horse run of Star Wars comics-- and yet people keep wanting to make figures from the novels. Ah, the fun of the hobby. If we could fight to the death to decide who does and doesn't get made, surely we would. Ah, the fun of the hobby. I'm not saying they should stop making figures from the comics, I just wish they could get a little more balanced. If we could fight to the death to decide who does and doesn't get made, surely we would. Definitely, plus many of the novel characters had profound impacts on the Expanded Universe, appearing in multiple books. Why should they get left out if Hasbro can prove that characters with little visual reference can be made.